Two weeks ago representatives of the key organisations involved in breastfeeding sat round a table to begin the first UK assessment using the World Breastfeeding Trends initiative tool. In the first presentation, this graphic popped up, and a collective “ooh” and then an “aah” went round the room. You may be forgiven for wondering why it generated such a response – it doesn’t look particularly inspiring! It’s because this picture demonstrates what happens when there is a strong national strategy on breastfeeding – and also what happens when there isn’t. In the late 1990s, Brazil made a concerted effort to improve infant health through a drive to increase breastfeeding rates in the country. They put in place legislation to protect mothers, training for health professionals, breastfeeding promotion – along with the money to pay for it all. And they had a national coordinated breastfeeding strategy to make it happen. At the same time, Mexico had no such national strategy. Half-hearted efforts were made in some areas, such as training for health professionals and public promotion of breastfeeding. 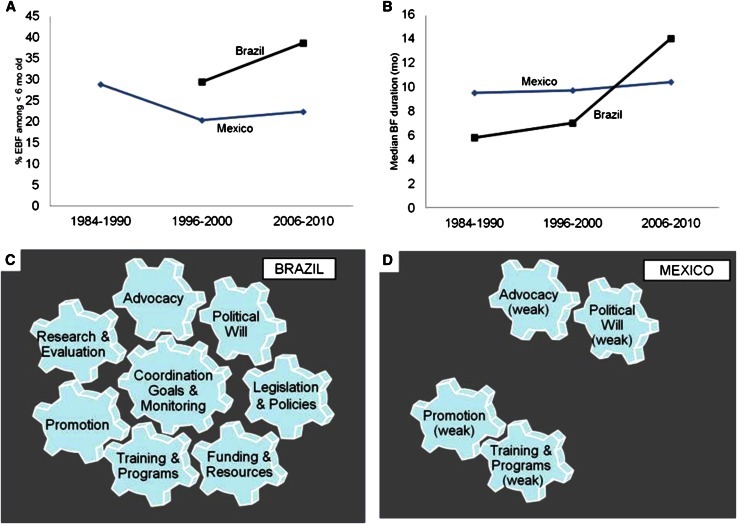 As the graphs show, Brazil was able to significantly increase breastfeeding rates over that period while in Mexico they stagnated. Without a strong, national, coordinated breastfeeding strategy to drive things forward, everything else is just wheels turning in the wind. That’s the metaphor – what does this all mean in practice for the UK? Let’s imagine a mother, who has her baby in a Baby Friendly hospital  and breastfeeding gets off to a good start. But then she arrives home and starts to experience some problems. Her health visitor suggests she gives the baby some formula . She’s seen some adverts on television and buys a particular brand of formula because it’s “closer to breastmilk” . She lives in a rural area, and the nearest breastfeeding support group is 10 miles away and she doesn’t drive . Her husband has seen the adverts too so he knows that “good dads do the night feeds” . After a couple of weeks the baby is getting more and more formula and is breastfeeding less and less. Her husband suggests she’s given breastfeeding a good go but maybe she should stop now . She had wanted to breastfeed for longer but she gives up . Indicator 2 of the WBTi asks – are babies born in Baby Friendly hospitals? Indicator 5 asks – do health professionals have adequate breastfeeding training? Indicator 3 asks – is the International Code of Marketing of Breastmilk Substitutes fully implemented? Indicator 6 asks– do all mothers have access to breastfeeding support in the community? Indicator 7 asks – do parents have access to good information about breastfeeding and the risks of using formula? Indicator 12 asks – what percentage of babies are exclusively breastfed for the first six months? Without this central cog (Indicator 1) driving all the other cogs (Indicators 2-10) things cannot move forward. This point is also made clear in a new report from Save the Children, which looked at breastfeeding policies and practices in six countries, including the UK. Indicator 1 of the WBTi assessment asks whether a country has each of the above and gives a total score out of 10. 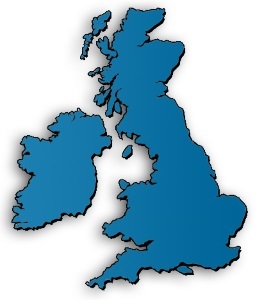 How well do you think the UK as whole will score? How would the countries of the UK score individually? What do we need to do to improve that score? How can policies be turned into actions at a local level? Post your comments below or on our Facebook page. In the next blog post we will be talking about Indicator 2 – Baby Friendly care and Baby-Friendly Hospital Initiative and will be asking for your thoughts about how things can be improved. What is the WBTi (and why does it matter)? Don’t be fooled by the uninspiring acronym – the WBTi is the most exciting thing to happen in breastfeeding in the UK for years! The name stands for the World Breastfeeding Trends initiative and it was launched in 2005 by IBFAN, and the idea is to take a snapshot of breastfeeding in a country – the policies, practices and breastfeeding rates – and then (and this is the important bit) to create some recommended actions to improve things. The assessment is then repeated 3 to 5 years later and a new set of recommendations are made. The idea is to create an upward trend of continuing improvements over time so that more babies are breastfed and for longer, improving infant and maternal health. · All governments should develop and implement a comprehensive policy on infant and young child feeding. · All mothers should have access to skilled support to initiate and sustain exclusive breastfeeding for 6 months and ensure the timely introduction of adequate and safe complementary foods with continued breastfeeding up to two years or beyond. · Health workers should be empowered to provide effective feeding counselling, and their services be extended in the community by trained lay or peer counsellors. · Governments should review progress in national implementation of the International Code of Marketing of Breast-milk Substitutes, and consider new legislation or additional measures as needed to protect families from adverse commercial influences. · Governments should enact imaginative legislation protecting the breastfeeding rights of working women and establishing means for its enforcement in accordance with international labour standards. The WBTi breaks down the Global Strategy into 10 areas (indicators) and asks a short set of pertinent questions to see how the country is doing in each one. Where gaps are identified, recommendations are put forward to fill them. Studies show that countries that have enacted the Global Strategy – in all 10 areas, not just a select few – have seen great improvements in their breastfeeding rates.